Proving that classic fruit themed slot machines are thriving, NetEnt released its Double Stacks online slot on September 24, 2018. It puts a modern spin on the very first type of slot machine game ever played by the masses. And it is a little bit similar to slots like BerryBurst. Unlike the fruit machines of the past, this one boasts brightly colored symbols. With a dark as night background, the graphics really stand out. The animation used in the game is nothing short of spectacular. Above the reels is a quartet of windows revealing each symbol’s highest possible cash prizes. The colorful symbols that adorn the reels are cherries, melons, plums and lemons. Symbols that may become stacked include sevens and diamonds, bells and the classic bar symbol. The game’s wild symbol is simply the word “wild” written on a gold star. The glittery scatter symbol is the word “scatter” contained in a bright circle. Landing at least three scatters on the reels at once triggers free spins. Three scatter symbols get players five free spins. If they get four scatters, 15 free spins are awarded. Those that get five scatter symbols get 30 spins of the reels for free. Getting at least two scatters on the reels during free spins triggers more. This gives players two extra free spins. As many as five scatters may appear on the reels during free spins. If they do, players get 30 more spins for free. Throughout free spins, many symbols may appear as stacked. Any stacked symbol that takes up an entire reel doubles the value of all symbols on the reels. One of the pleasant surprises about Double Stacks is its soundtrack. Featuring upbeat 1980’s music, the game offers a nostalgic feel to many players. This helps contribute to the classic theme of the game. While the reels are spinning, players can enjoy the classic tunes. 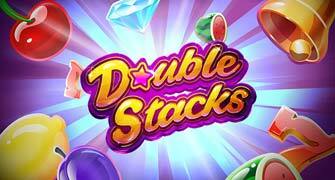 Double Stacks is one of many recent fruit themed online slots. Players that enjoy the game may also enjoy similar titles. These include Amazing Fruits, best known for its progressive jackpots. It also includes Fruit Stack Super Double Wild by Cayetano and Bally’s Quick Hit Platinum. Unlike those games though, this one has a fancy new look to it. Players that enjoy games such as Starburst will see this game is just as bright. For many, that adds an extra level of excitement to the experience. Immersing one’s self in a classing gaming experience is an unforgettable getaway. Without even leaving home, players can enjoy some quality entertainment. There are so many fruit themed games to choose from. However, Double Stacks is sure to impress today’s slot machine players. 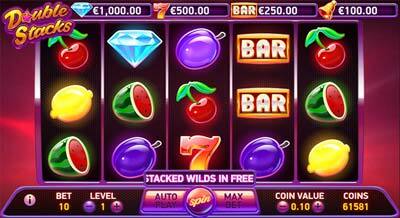 By adding modern twists to the classic fruit game, NetEnt is making slots more fun and interesting. The company will likely continue to release similarly themed games to online casinos everywhere. Players of all ages and experience levels can see how much fun fruit games are. This classic theme is sure to remain a staple within the industry.